Bashundhara Kings were featured by La Liga in a recent video in their social media platform as they lauded the efforts taken by Bashundhara Kings to advance Bangladesh football. The video featured Bashundhara Kings Head Coach Oscar Bruzon talking about Bashundhara Kings and Bangladesh’s football scene on Tuesday. Oscar Bruzon highlighted the professional nature of Bashundhara Kings as he dwelled on Kings’ focus to develop Bangladesh’s football with a bottom up process. “Our club is a very professional one. We are trying to work on our grass roots talent and in our first season at the top tier of Bangladesh’s football we have started well and the ambition of the club is endless,” said Oscar. He later went on to summarise the steps taken by Bashundhara Kings to reach the apex of the regional footballing spectrum. “Bashundhara Kings are trying to recover the lost glory of Bangladesh’s football. We are trying to increase our fanbase , we are trying to work on the grass root level, we are trying to work in terms of development. Hopefully in the next five years we will get the results and football can return to the right track,” told Bruzon. Oscar being a Spaniard himself hoped that more and more Spanish football professionals will come to Bangladesh in the coming years to help Bangladesh develop the football infrastructure and improve the quality. 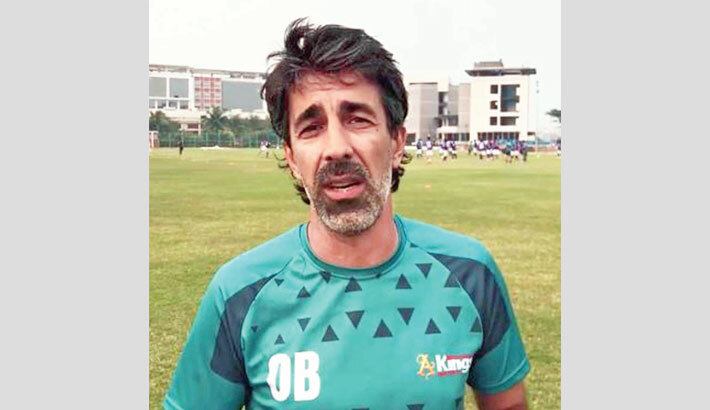 “I hope that Bashundhara Kings’ triumphing run and the announcement of a more stronger leagues in the upcoming seasons will pave way for professionals from Spain come here in Bangladesh and help in the development,” hoped Bruzon.